Santa's Bingo ❅ £35 FREE when you join! Santa's Bingo debuted on the Live Bingo Network in November 2014, right on time for the Christmas holiday! 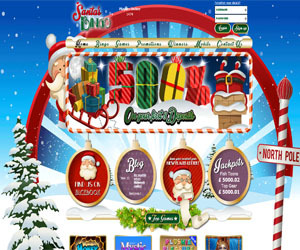 To begin with, new players at Santa's Bingo receive a very merry 500% bonus package towards their first three deposits. Once they're full signed up, players can ride their slay on over to the promotions page which is absolutely stacked with all sorts of incredible bingo bonuses. One of the top Santa's Bingo promotions is the Deposit ‘n' Win Day promo which gives players extra playtime in free bingo tickets and free bets every single Thursday. Other top promos include Flashback Fridays with 5% cash back, Saturday Night Fever with £10 in free bingo tickets and free spins, Save the Date Sunday with £10 in free bingo tickets and Lord Bingo's favourite, Hot Ball Tuesdays with 50% bonuses and free bingo tickets. Santa's Bingo has tons of amazing games. Besides the fun chat games with incredible prizes Santa's offers players an amazing selection of 90-ball bingo, 80-ball bingo, 75-ball bingo and even 30-ball speed bingo games. The daily progressive jackpots on the bingo games are as high as £2,500 on a regular basis. In addition to the sensational bingo games selection, Santa's Bingo also caters to players with a vast array of slot games, casino games, scratch card games and freebets. Some of the top slot games on Santa's Bingo include the brand new Plushie Pleasure, Mystic Wilds, Honey Bees, Queen of Legends, Wizards Castle, Kitten Ball and the incredible new Five Pirates slot game. Players can also enjoy playing Classic Blackjack, Deuces Wild, European Blackjack, Keno and more in the casino selection. The Santa's Bingo mobile platform lets players access all of their favourite games on the go via their mobile devices. The formats supported by Santa's Bingo include Apple iPhone, iPad and iPad Mini as well as Android Phones and Android Tablets. Players can choose from a lovely variety of slots including Queen of Legends, Rubies and Sapphires, Treasures of Egypt and more. There's also a sensational mobile casino games selection that includes roulette, blackjack and keno.